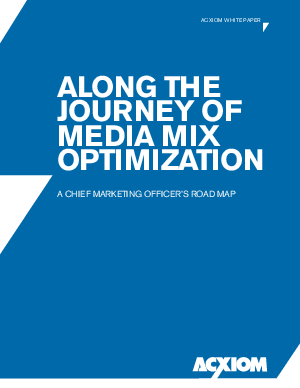 In this paper Acxiom shows how Media Mix Optimization can help overcomethe complex challenges of today’s marketing. Herein we not only detail boththe “Journey” of MMO and its rewards but also how to avoid several keyhurdles along the way. The modern Chief Marketing Officer faces dauntingbusiness challenges in the new marketing arena.Many of those challenges are discussed within thispaper. They range from the obvious to the morecomplex. How does a CMO address and overcomethese challenges, while creating a world-classmarketing machine in the process?